Aggression is increasingly seen in most parts of South African society. Aggressive behaviour of boys in secondary school often results from frustrations caused by perceived high expectations of others regarding the role, locus of control, and personality of boys. Locus of control plays an important role in a person's perception concerning a situation and possible reactions to what is happening, or should be happening. A 56-item questionnaire, based on Rotter's "Locus of control" questionnaire, and the DIAS Scale were used. The questionnaire was completed by 440 boys in Grades 9, 10, and 11. Various factor, item and differential statistical analyses were conducted. Three constructs were identified, i.e. physical, verbal, and indirect aggression. Results indicated that locus of control has a significant influence on verbal and indirect aggression. The differential analysis indicated that contextual variables (language of tuition, age, and grade) play a significant, but not substantial, role in aggression. Furthermore, boys with an internal locus of control are significantly and substantially less aggressive than boys with an external locus of control, with respect to physical, verbal and indirect aggression. Why are only some adolescents in schools guilty of explicit aggressive behaviour? Why are the acts of aggression apparently higher in some schools than in others? Why does it appear that certain individuals are apparently more in control during perceived aggressive situations in comparison to others? How do a person's locus of control and the level of internalisation thereof influence a person in a more reserved way in situations that would otherwise demand aggressive reactions? According to Jaffe (1998:527) some persons believe that they have no personal control over circumstances. These persons are functioning from an external locus of control and perception of their own aggression. Rotter describes "locus of control" as "... the degree to which individuals believe the things that happen to them are due to internal versus external factors" (Cooper, Okamura & McNeil, 1995:29-31). If individuals believe that they have no control over the circumstances of their lives (external locus of control), they will act according to such beliefs. Thus, and vice versa, when persons believe they are in control over life or circumstances (internal locus of control), such persons' behaviour and actions will reflect this stance (Chan in Valentine, Silver & Twigg, 1999:1268).  What are the implications of such possible relationships? In this article we explore the relationship between perceptions of adolescent boys of their own locus of control, demographic variables, and aggression. A deductive strategy is followed to accomplish this objective. From the findings concerning identified relationships, recommendations and guidelines are proposed. In this article perception refers to the experience of sensing, interpreting and comprehending the world in which one lives (Kaplan & Saddock, 2007:281; Kneisl, Wilson & Trigoboff, 2004:143). Many researchers, psychologists and educators describe adolescence as the developmental stage from the age of 12 to 18 years (Cooper, 2002:43). During this period in an individual's life, new and demanding challenges regarding approaching adulthood often confront an adolescent. These challenges include discovering their own identity. This can cause many problems for adolescents when discovering who they truly are, and not how other people want them to be (Kaplan & Saddock, 2007: 210). Often the demands posed by these challenges are at the root of the frustrations experienced by the individual adolescent and these are the cause of aggression (Blau & Gullotta, 1996:78; Balk, 1995:21). If adolescents perceive and experience that external factors are in control of situations, these adolescents will act differently from those adolescents who perceive and experience that they are in control of what is happening. The term "locus of control" originated from Julian Rotter (1966) (Pratt, 1987: 7-8; Kazdin, 2000:68; Rotter, n.d.). He distinguished between an external and an internal locus of control. The dominant type of locus of control present in a person's life often determines his or her reactions and behaviour. The dominant type of locus of control of an individual, whether external or internal, can also be used to explain the perceptions and motivation of a person's actions. In accordance with the above, Erikson (Louw, 1993:58) states that adolescence is the stage during which individuals discover their own identity. This stage, which Erikson calls stage five, identity versus role confusion, is between the ages of 18 and 21 years. During this stage, late adolescents are mostly concerned with what other people think of them, instead of how they see and feel about themselves (Kaplan & Saddock, 2007: 210). Role models play an important role during the process of identity formation (Meyerhoff, 2005:8; Enger, Howerton & Cobbs, 1994:269; August, Realmuto, Crosby & MacDonald, 1995:521). Locus of control forms an integral part of the identity formation of an individual adolescent. Moreover, socio-economic conditions, abuse, personal and interpersonal skills, personal relationships and culture are the context in which identity formation takes place (Swart, 1988:4; Marks, 1998:254). In the next section, the individual adolescent boy's perception of his own locus of control is operationalised in terms of his own actions and behaviour. This operationalisation is in terms of items referring to an external or internal locus of control. Only boys will be discussed. A person with a dominant external locus of control perceives and attributes the consequences of what happens to him as being independent from his behaviour. Such a person is convinced that anything that happens is the result of fate, chance or external powers (Swart, 2004:23). An external locus of control indicates that a person believes that he does not have control over circumstances. These beliefs that negative outcomes will occur that are beyond their control often lead to a depressive outlook on life (Jaffe, 1998:572). This often causes feelings of anger, frustration and aggression (Perlow & Latham, 1993:831; Stroms in Perlow and Latham, 1993:833; Stevens, 2002: 316). A questionnaire was developed that adolescent boys could use to assess their own perception of aggression and locus of control. The questionnaire consisted of items that participants could use to assess their own perceptions concerning the causes of what was happening to them. In this questionnaire the following items were included: 12 items referring to perceptions of circumstances as being out of control; four items concerning restricted control regarding involvement in society; and three items concerning the refusal to take responsibility for own poor test results (see Breet, 2006, for the specific formulation of individual question items). Finally, three items were included regarding adolescent boys' perceptions that respect and admiration from other persons are perceived as resulting from own actions and behaviour. The perception of own locus of control of a person, namely, internal locus of control, is addressed in the following paragraph. Lang (1996:192) describes the inner locus of control of a person as " ... a power of choice that carries with it both the freedom and the right to choose, and the burden of responsibility for one's choice". The inner control of a person develops from a conscious and active decision to accept responsibility for one's choices and to control one's feelings (Rotter & Hochreich, 1975:86; Kugelmass, 1973:141; Chan in Valentine, Silver & Twigg, 1999:1268; Brunas, 1998:106; Gershaw, 1989). Individuals with an internal locus of control can manage stressful situations effectively by using problem-solving strategies (Storms & Spector, 1987:227; Marks, 1998:257; Anonymous, 2004:9; Grimes, Millea & Woodruff, 2004:132). A person's locus of control can change and develop with age. Hopkins (1983:412; Sparrowmediagroup, n.d.) indicates that younger children are often more prone to act in accordance with a predominantly external locus of control, whereas in comparison, older learners are more inclined towards acting in accordance with an internal locus of control. Anderson (Pratt, 1987: 21) states that it may even happen that individuals with a greater inclination toward an internal locus of control can change to a greater inclination toward an external locus of control. This might happen because of certain experiences encountered by an individual. Next the perception of aggression is discussed as a possible result of the perception and management of frustrations in accordance with a person's perception of own locus of control. Aggression can present as destructive behaviour when the aim is to harm another person. A national survey of secondary school students in the United States of America reported that 28% of the boys and 7% of the girls had been in a physical fight the previous month (Kaplan & Saddock, 2007:154). In a South African research project, secondary school learners expressed their experience that boys are more violent and aggressive than girls in their schools (Botha, 2006:123). Literature (Baron & Byrne, 1994:465; Berkowitz, 1993:393; Schaffer, 2002: 459) refers to gender differences in aggression and states that it seems that girls on the one hand tend to engage in indirect forms of aggression and verbal aggression such as shouting, gossiping, rejecting friends and spreading rumours. Boys, on the other hand, tend to engage more in physical forms of aggression like using weapons, kicking and hitting. Baron and Byrne (1994:465) and Schaffer (2002:493) state that research indicates that boys tend to use direct forms of aggression such as kicking, striking other persons, profanity, verbal abuse, pushing and shoving. Aggressive behaviour is also not consistent within a specific individual and often tends to change. As one becomes older, aggressive behaviour canchange from physical to verbal (Epanchin, 1987:109; Österman, 1999:8). Coie and Dodge (1998:768) and Goodenough (Epanchin, 1987:115) show that aggression is more individually orientated during adolescence in comparison to a more "instrumental inclination and manifestation" during the pre-school age, that is aggression is used as a instrument to reach a certain aim. Regardless of high expectancy from society regarding the role of adolescent boys and men (Franklin, 1986:48; Frank, 1996:116; Epanchin, 1987: 116; Kilmartin, 2000:247), aggression often varies with reference to internal factors (emotional and cognitive problems, poor social skills) and external factors (family problems, abuse and neglect). Perceptions concerning these contribute toward expressions of aggression (Jaffe, 1998:515; Christiansen & Evens, 2005:298-316; Anderson, 2000:163; Hunt & Marshall, 2002:47; National Youth Violence Prevention Resource Center, n.d.; Miller, 1993:11). Perceptions and actual victimisation of learners by educators and other administrators from the school staff can sometimes be the cause of aggression in schools. Imposing irrelevant and even unrealistic measures in the name of discipline, according to Coleman and Webber (2002:227), can also provoke an individual adolescent's aggression. The manifestation and perception of aggression of adolescents can thus change with time, because an individual's perception of his locus of control can change. The perception of an individual of his own aggression can also change because of his perception and experience of changes in his environment and the actions of other persons towards him. The manifestation of aggression can take various forms. For the purposes of this article, the focus will be on physical, verbal and indirect aggression (Björkqvist, Lagerspetz &Österman, 1992). Physical aggression includes destructive and hand-to-hand fighting types of behaviour. The purpose of such behaviour of an individual is to harm another individual or oneself, or to damage property (Hoghughi, 1996:288; Simpson, Zionts & Zionts, 2002:79; Balk, 1995:475). Verbal aggression entails the emotional and psychological harm done to another individual through negative and degrading communication towards them (Johnson, 2003:314; National Youth Violence Prevention Resource Center, n.d.). According to Björkqvist, Lagerspetz and Österman (1992) indirect aggression refers to " ... attacking the target person circuitously, thereby attempting to avoid retaliation". Indirect aggression also refers to socially manipulative behaviour. Previous research findings indicate that an individual with an external locus of control tends to perceive and experience that he has no control over circumstances (Perlow & Latham, 1993:831; Stevens, 2002:316; Storms in Perlow & Latham, 1993:833; Interscience, n.d.). Often the consequences of such a person's perceptions and experiences are anger, frustration and aggression. Research (Grimes, Millea & Woodruff, 2004:132; Marks, 1998: 257; Shoal, Giancola & Kirillova, 2003:1101-1107; Storms & Spector, 1987: 227; Anonymous, 2004:9; Miller, Fitch & Marshall, 2003:548) further indicates that individuals with an internal locus of control in comparison to individuals with an external locus of control tends to handle stressful situations more effectively by making use of problem solving strategies. This investigation followed a quantitative empirical research strategy. This strategy was contextual, descriptive, analytical, and derivative in nature. The researchers used a questionnaire to gather data from participants. The questionnaire was compiled and adapted from existing questionnaires. Rotter's (1966) "Locus of control" questionnaire consisting of internal and external locus of control items formed one part of the questionnaire. A second part of this questionnaire was based on the DIAS ("Direct and Indirect AggressionScale") (Björkqvist, Lagerspetz & Österman, 1992) questionnaire. Questions on biographical aspects of the participants were added. In addition, question items concerning their perception of their own locus of control and their perception and manifestation of their own aggression were selected and adapted from other existing research instruments. The sample selection, validity and reliability of the questionnaire, and the differential statistical analyses, are described. These were adhered to throughout the research process. The participants were invited to participate voluntarily in completing the questionnaires. They could withdraw from the research without penalty. No data to identify individual participants were included in the questionnaire. The participants benefitted from completing the questionnaire as they had the opportunity to reflect on their own behaviour and the behaviour of other persons (Universal Declaration of Human Rights, 2006). The questionnaire consisted of items that participants could use to assess their own perceptions concerning the causes of what was happening to them (locus of control). Items were included to assess what is happening to them and whether this could be attributed to their own decisions and mistakes (faults) (see Breet, 2006, for specific formulation of the question items); and not making use of opportunities (two items). In addition, seven questions items were included concerning their perception of the consequences that their own behaviour was the result of "powers within themselves" that are realised through own efforts, skills and knowledge. Finally, five items were included concerning boys' perception that they had an active problem solving behaviour, for example, in the case of addressing the correction of political corruption (Rotter & Hochreich, 1975:86; Kugelmass, 1973:141; Chan in Valentine, Silver & Twigg, 1999:1268; Brunas, 1998:106; Gershaw, 1989). The items in the questionnaire dealing with the perception of physical aggression include the extent to which individuals hit, kick, trip, push, pull other learners or take their belongings without their permission (see Table1). The perception of verbal aggression items included in the questionnaire, are: items concerning the extent to which a person shouts at, insults, threatens to hurt, calls nicknames or harasses other learners as indicators of the perception of a person's own aggression (See Table 1). The items involving perception of specific indirect aggression included in the questionnaire are as follows. Items were included on the extent to which an individual excludes other learners from a circle of friends; makes friends with other learners to take revenge; ignores gossips, tells lies of other learners, plans behind the backs of other learners to betray them and reports bad things about them. Other items in this regard are to stir up other learners against a certain learner; to repeat a learner's secrets to another learner; to write insulting notes about a certain learner to other learners; to criticise another learner's hair/clothes; and to persuade another learner to dislike a certain learner whom one does not like (Table 1). This process of adapting and developing the questionnaire for this investigation, resulted in 56 items: the biographical detail of the participants (three items); the "locus of control" (29 items) with a choice between two statements; and the aggression items (24 items) on a 5-point scale (Breet, 2006). Variables concerning the biographical aspects of participants were also included in the questionnaire. A pilot study was used to test and adapt the questionnaire, before it was implemented. A stratified (Sapsford, 1999:8) random sampling procedure was used to obtain the sample of boys (Bless & Higson-Smith, 2000:86; Walsh, 2001:45). Two secondary schools in the Western Cape province of South Africa in a middling socio-economic environment were identified and selected. Eventually 440 adolescent boys participated in the investigation; 157participants were Afrikaans and 283 were English speaking. They were between the ages of 14 and 18 years with an average age of 16 years; also 150 of the participants were in Grade 9, 159 in Grade 10, and 134 in Grade 11. Content validity (See Vockell & Asher, 1995) was ensured by using items representing the theoretical framework. The answers of the participants on the biographical variables were used to assess whether the variables, i.e perception of own locus of control and aggression of boys, were sensitive for the context in which these adolescent boys were coming from. Also, the perceptions of the participants of their own locus of control as reflected in the responses on the items were gauged against the theoretical literature on the perceptions of a person's own locus of control. Lastly, it was ensured that the dependent variable, perception of own aggression, reflected existing literature and research concerning the manifestation and extent of aggression (Breet, 2006). Preliminary analyses were conducted concerning the construct validity of perceptions of own aggression. To assess construct validity, a first and second order factor analysis was conducted on the data gathered on the 24 aggression items in the questionnaire. During the first order factor analysis, a principle factor analysis with orthogonal axes (Field, 2005:740) and varimax rotation (Field, 2005:749) was done. During the second order factor analysis, the export of the first order analysis was used as import to conduct second order factor analysis. 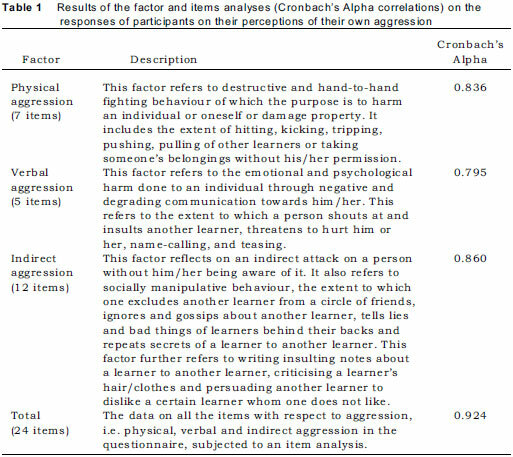 Four factors were identified, of which one factor indicated physical (seven items with a Cronbach's Alpha of 0.847 and no item rejected), a second factor verbal (five items with a Cronbach's Alpha of 0.820 and no item rejected) and two factors reflecting indirect aggression (12 items with a Cronbach's Alpha of 0.924 and no item rejected). The 24 items together gave a Cronbach's Alpha of 0.924, reflecting a high reliability of the research instrument overall (see Table 1 and Breet, 2006). When the factors in Table 1 are measured against the theoretical background and the results from the statistical analyses, they can be regarded as valid and reliable. No factor analyses were conducted on the biographical and locus of control items as these variables were measured on nominal and ordinal level. In the further analyses described in this article, biographical variables and the perception of the locus of control of the adolescent boys were used to compare the data of groups of boys on their perception of their own aggression. First, the significance of various multiple variable differences was investigated (Hotelling's T-square, multiple analyses of variance [MANOVA]) between groups). Once a significant multiple variable difference had been identified, this was followed by the investigation of univariate differences between groups of adolescent boys' perceptions of their own aggression, i.e. Student's t tests or analysis of variance (ANOVA) and Scheffè/Dunnett post-hoc tests). The significance of differences, whether on multivariate or univariate levels, is reported on the 0.01 or 0.05 levels. Where it was found that a difference on multivariate level was not significant, no further univariate analysis followed. Once a significant difference on multivariate level was indicated, and it was followed by a significant difference on univariate level, the finding was finally scrutinised for the "substantiality of a finding". This is viewed as a prerequisite for arriving at a specific finding concerning data and statistical analysis. Discussion of the analyses is done in terms of an investigation concerning the comparison of language groups and aggression (Table 2); age groups and aggression (Table 3); grade groups and aggression (Table 4); and groups with an internal versus an external perception of locus of control and aggression (Table 5). Concerning the differential statistical analysis and interpretation regarding the perception of aggression, the factors (manifestations) identified during the first and second order factor analyses, namely, physical, verbal, and indirect aggression, were used (Table 1). The differential analysis with respect to language of tuition and perception of aggression indicated that a significant multiple variable difference between boys taught in Afrikaans and in English was identified on the 0.01 level (p = 0.01; Table 2). Following this analysis, a significant univariate difference was indicated between Afrikaans- and English-speaking learners on the 0.05 level with respect to verbal aggression (p = 0.016). English-speaking learners were significantly more verbally aggressive than Afrikaans-speaking learners. Although a significant difference was found for learners, it was not substantial because of the average scores 2.23 versus 2.43 on a 5-point scale (Table 2). It thus appears that language of tuition did not play a substantial role in the perception of aggression of adolescent boys from the two schools. The differential statistical analysis with respect to age groups and perception of aggression indicated a significant multivariate difference between younger and older boys with respect to perception of aggression on the 0.01 (p = 0.005; Table 3) level. With respect to the univariate analyses, it appeared that boys aged 15 years had a significantly lower average on indirect aggression than 17 years old boys. Again, inspecting the real differences between the averages in Table 3, these significant differences cannot be judged as real (substantial) differences (1.66 versus 1.80). It thus appears that age did not play a substantial role in the perception of aggression of adolescent boys from the two schools. Regarding the comparison of the perception of own aggression of boys from different grades, there was not a significant difference (multivariate p = 0.148) identified between learners in Grades 9, 10, and 11 (Table 4). It is clear that this biographical variable does not play a significant or substantial role regarding the interpretation of the differences of the perception of aggression of groups of adolescent boys in different grades. On inspecting the averages in Tables 2, 3, and 4, it is clear that the largest average is that of the verbal aggression of the English group (2.43 on a five-point scale). All other averages are smaller, most even substantially smaller. This is an indication that the levels of aggression within this specific group are not excessively high. Finally, the significance of the relationship between the perceptions of own locus of control and the perception of aggression of adolescent boys was investigated. The coherence between boys' perceptions of their own locus of control and aggression was examined by making use of the correlation calculations. Significant coherence (correlation) was identified on the 0.01 level between locus of control and the various manifestations of aggression. Locus of control correlated significantly with physical (0.279), verbal (0.200), indirect (0.175) and aggression in total (all items included (0.197)) for all the adolescent boys. Thus a significant relationship between locus of control and all the manifestations of aggression was identified. The finding that there is a direct relationship between locus of control and aggression, and physical, verbal and indirect aggression, is in agreement with the findings of Österman, (1999). The analysis concerning the relationship between perceptions of own locus of control and aggression was followed by an investigation of the differential analysis regarding the significance of differences (Table 5). On the multivariate level there was a significant difference between boys with an external and internal locus of control on the 0.01 level (p = 0.006; Table 5). A univariate analysis followed this identified multivariate significance difference. It was found that boys perceiving themselves as having an external locus of control, in comparison to boys perceiving themselves as having an internal locus of control, had a significantly higher physical (1%), verbal (1%), and indirect (1%) level of aggression. The averages of boys perceiving themselves as having an external locus of control, in comparison to boys perceiving themselves as having an internal locus of control, was significantly and substantially higher, i.e. for physical (1.57 < 1.92, see Table 5), verbal (2.22 < 2.58, see Table 5) and indirect aggression (1.60 < 1.85, see Table 5). The differential analysis indicated that contextual variables (language of tuition, age, and grade) do play a significant, but not substantial, role in the extent of the differential manifestation of aggression of adolescent boys. This can be seen as a slight indication that context does play a role. However, more research in this regard is necessary. Furthermore, boys with an internal locus of control are significantly and substantially less aggressive than boys with an external locus of control with respect to physical, verbal, and indirect aggression. These findings, however, are preliminary, and further research in this regard appears necessary. The research reported here confirms the findingscited by Österman (1999) of a direct relationship between the three manifestations of aggression (physical, verbal, and indirect aggression) and locus of control in adolescent boys in this sample. Some of the important educational implications are that teachers and parents alike should take cognisance of the fact that, on the one hand, the more adolescent boys are inclined towards an external locus of control, the higher the level of physical, verbal, and indirect aggression may be. On the other hand, if an internal locus of control is prevalent in adolescent boys, aggression may be lower. Personal responsibility for one's own actions is in our view the single most important aspect in the life of adolescent boys where aggression is concerned. As indicated in the various items in the questionnaire, these are prevalent in the simple aspects of everyday life and decision-making. In this research the finding concerning the role that context plays with respect to aggression was not clear. However, Hunt and Marshall (2002:245) indicated in their research that environment does play an important role in providing security for learners, especially those learners acting disruptively. Thus, the findings of this investigation indicate that healthy interaction and communication (Johnson, 2003:395-400) between educators and adolescent boys are some of the important educational imperatives confronting educators and there may be a need for a special programme to be developed. Educators should pay special attention to stimulating boys and ensuring that they are aware of the importance of taking responsibility for their own actions. The more educators prepare learners to handle frustration and other challenging circumstances such as emotional challenges and behavioural expectations, the more able and fit learners should be in handling everyday challenges with regard to aggression (Hunt & Marshall, 2002:245). Again, it seems imperative that adolescent boys be stimulated and challenged to take responsibility for their own actions and decisions. Although life skills training is a compulsory component of life orientation as a subject in secondary schools, research is necessary to ascertain whether the impact of this on the development of adolescents is in fact as envisaged. Lettie Breet is an educational psychologist in private practice. Chris Myburgh is Professor in the Department of Educational Psychology at the University of Johannesburg. He is a widely published established researcher. Marie Poggenpoel is Professor in the Department of Nursing Science at the University of Johannesburg. She is a widely published established researcher.